These barbed and tanged arrowheads on display at the West Highland Museum in Fort William were found at various locations in Lochaber and along the Great Glen. They are a type characteristic of the Bronze Age. The barbs helped the arrowhead stick into the prey, while the tang helped to keep the arrowhead firmly attached to the shaft. 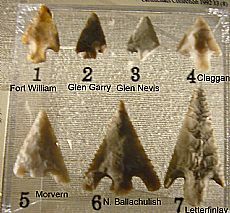 Bronze Age barbed and tanged arrowheads were made of various types of stone, made by striking (knapping) flakes which were then finely shaped using pressure-flaking techniques. Flint was often preferred, and finished and raw materials were probably widely traded in the Highlands. Bronze Age arrowheads are often found in Bronze Age burials, sometimes with stone wristguards, prestigious equipment for warrior males. Many are also found when fieldwalking.